As part of our project leadership training series, leadership coach Susanne Madsen discusses a way to measure project success beyond the simple “triple constraint” of time, cost and quality. For additional leadership training, check out Susanne’s previous video How to Influence Different People on Your Team. Project managers typically measure success by the triple constraint of time, cost and quality, but Susanne noted that there are limitations to this way of thinking. That is, even if you’re fulfilling the three points of the triple constraint, you may neglect adding value to the end user or the business, which jeopardizes the real benefit of the project. Therefore, she recommends taking the triple constraint and adding another layer to it. That layer is the effect (on the strategic objectives), the relevance (to users) and sustainability (the project after you’ve completed it). By extending your metrics beyond just the triple constraint, Susanne demonstrates, you will have a better rule by which to measure your project. Pro-Tip: The end user can often be overlooked, especially outside of Agile or Lean projects. That’s a mistake. They’re the impetus for the whole project, no matter how large or how small or what methodology you’re using. Therefore you need to know as much about them as possible in order to extend your measure of success beyond the basic time, cost and quality metric to include strategy, relevance and sustainability. Take it further: Read 5 Ways to Engage End Users by Stephanie Ray to learn how to invite them into your project planning and to help you develop metrics that support their objectives. Hi I’m Susanne Madsen. Welcome to this whiteboard session “How To Measure Project Success”. Now as a project manager, you may be well aware of the triple constraints of time, cost and quality. 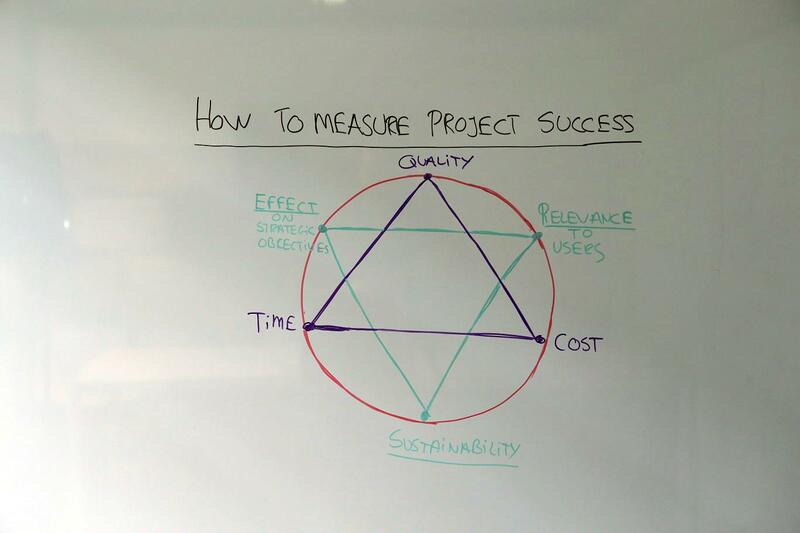 This is how we traditionally measure projects success. Projects must be delivered on time. That means it must hit the deadline. We must keep it within budget, that’s the cost aspect and of course it must be to the required quality, that’s requirements. This is traditionally how we measure success and this may be how you’re doing it today but there is a problem here. The problem is that even if you are delivering an outcome on time, cost and quality, it may not be adding value to the end users or to the business and that means that there is no benefit. Maybe you have experienced this. By the time you deliver something the strategy has already changed or the users never adopted it so the whole project was in vain. So to truly measure success, we therefore need to take into consideration some further dimensions. Those further dimensions I have drawn up on the board with the green triangle. The time, cost, quality aspects are drawn up with the purple triangle. The aspects of the green triangle, which I call the strategic aspects, are the effect on the company’s strategic objectives. So if you have delivered something, what effect is it having? Is it helping your company to reduce headcount? Is it helping your company to get more customers? What does it helping to do? What are the benefits? We also need to consider the relevance to the users. If the users aren’t adopting this because the timing is poor, then what is the benefit of your project? Surely that is not a success. And lastly the sustainability aspect. You must consider the success of your project and the sustainability aspect after two, five and ten years. Are the materials still sustainable? Is the solution durable? So you see, it is when you consider all of these aspects, the tactical triangle as well as the strategic triangle, that you can measure the project’s true success. Do not leave these strategic aspects only to the sponsor. Take control of it so that you can ensure success.